Marque Reception Desk 55316, are Economical and Great Looking. This Reception Station Features a PLEXI opaque 'Lite' Friendly Work Area. 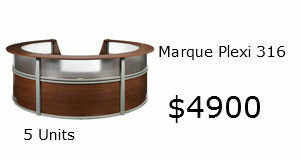 Marque Reception Desk 55316, $4900, OFM 55316, are Flexible. 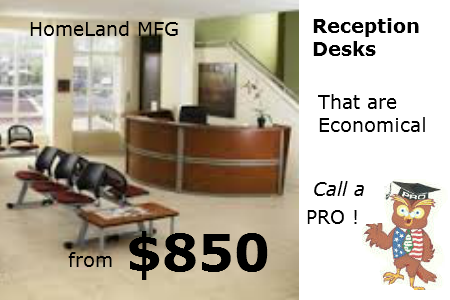 OFM Reception Desks are available with add-on units. 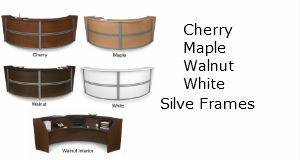 The Marque Reception Desk 55316 comes in 3 Wood Grain Finishes and White. Adding an ADA desk makes this area very useful and attractive too. All styles have an attractive silver frame. Matching File Pedestal is available. No tools are required for assembly. The OFM 55316 is a FIVE RECEPTION UNIT,,,Call a PRO.